From deepest darkest Peru to the storerooms of the Manchester Museum, this ceramic jug dates from somewhere between 200 and 300 AD. It is a product of the Nasca culture which inhabited the South Coast of Peru up until 800 AD. Renowned for their detailed ceramics, the Nasca peoples had no written tradition so they used the iconography of their textiles and pottery to communicate their histories. This perfectly preserved ceramic jug made its way from the Andean valleys to the collection of the Manchester Museum, where I found it. I was led by Living Culture curator, Stephen Walsh, through the rabbit warren of exhibitions. Ancient Egyptian tombs peeked out through bubble-wrap, and feather-like bird skeletons perched, seemingly about to take flight, around me. Despite its unassuming exterior, the Museum has over 4 million objects in its extensive collection, ranging from entomological specimens to Greek and Roman coins. This particular ceramic jug, however, is what captivated me the most. Although it is not certain, Stephen believes it could be a drinking vessel involved in some kind of ceremony or perhaps for medicine. Likely to be some kind of shaman, the attention to detail in the subject’s face, right down to his facial hair, shows a desire to accurately represent him, so clearly he was an important figure. His headdress depicts a Pampa Cat (a native species to South America) and he is holding what Stephen presumes to be a snake. Classically, an animal that denotes power and strength — grasping one by the throat could only be the move of someone just as brutish. The headdress, however, is undoubtedly the highlight. From the detailing of the tail hanging down the back of the man’s neck and the still bright red tongue jutting out in a challenge to the drinker. 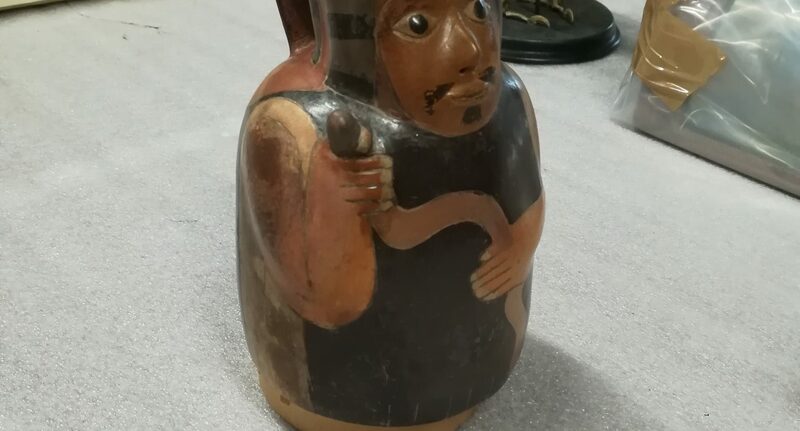 Originally collected from the Peruvian city of Ica by Pharmaceutical giant Henry Wellcome, this jug was donated to the Museum in the 1990s. After making his fortune, Wellcome dedicated his money to amassing a huge collection of artefacts which related to traditional medicine. Following his death, Wellcome’s collection was donated to museums across the country. The possibility of this as some kind of vessel for a medicinal drink, therefore, likely attracted him to it, but there’s no certainty that this was the case. Even as I stand there in the storerooms of the museum I can think of thousands of ways it could have been used in such a symbolic and ceremonial culture. The captivatingly anthropomorphic jug provides a glimpse into this mysterious culture. The otherworldly universe of shamans and ceremonies is transplanted, through this small piece of pottery, into our decidedly separate everyday lives in Manchester. And as I step back out into the sharp November wind I can’t help but feel a part of me drawn back to the provocative ogle of the Pampa Cat headdress and to the ancient hands who crafted it.